We reply to emails usually within 48 hours. Some technical questions may take a little longer. If you have no reply after 3 or 4 days this means that something has gone wrong. If you do not sent emails often you should check if everything is OK with your email address. Unfortunately email has become less relieable over the last few months. The reason for this is that many providers specially in the USA are using spam filters. Of course those filters are necessary since the amount of spam on the internet has become a serious problem. However the filters sometimes filter the wrong messages (see this article by CNN for example). It appers that messages from foreign countries to the USA – for example from Germany to our US customers – are sometimes blocked. If you should not receive a reply to your email and feel that this happened in error, please give us some other possibility to contact you, for example an email address at a different provider, a phone- or fax number or your postal address. We will ship our clocks to any place in the world. Shipping is included in the price that you see on our website. It is possible that you have to pay customs duty when the clock arrives. This depends on the laws of your country, we have no control over this from here. Customers in the USA sometimes have to pay nothing, sometimes about 6% of the value of the clock given on our website. If you live in another county you should try to get information about customs before ordering. It is our experience that customs duty can be very expensive in some countries, for example in India. The estimated delivery-times refer to shipping to the USA, shipping to other countries may take longer. Please note that we have to rely on 3rd parties like the cuckoo clock manufacturers and the mail. It is quite hard to predict exactly when a clock will arrive. The estimated delivery-times refer to shipping to the USA, shipping within the EU will usually be a little faster. Please note that we have to rely on 3rd parties like the cuckoo clock manufacturers and the mail. It is quite hard to predict exactly when a clock will arrive. Our clocks come with two years of warranty and are insured for shipping. If you should experience any problems when you receive the clock, please contact us before taking any action. Usually shipping works quite well, the clocks are packed carefully to avoid damages in transport. Most cuckoo clocks run for many years without problems. 1. First we will check if there is an easy solution for the problem. One Example: An easy solution if the cuckoo of your clock does not work may be that it has been turned off with the night shut-off. 2. If there is no easy solution, one of our service stations can care for your clock. We have service stations in many countries, they can solve technical problems or replace parts (like damaged carvings) with new ones that we send from Germany. 3. If there should be a more serious problem, the clock will be shipped back to the manufacturer in Germany. There it will either be repaired or replaced. Please note that warranty does not cover damages that were caused by the customer. Black Forest cuckoo clocks are driven by a mechanical movement which is run by weights under the clocks. To keep them working you have to pull up the weights from time to time. With 8-day cuckoo clocks you have to do this once a week, with 1-day cuckoo clocks each 24 hours. Quartz cuckoo clocks are driven by batteries. They are not as authentic as mechanical cuckoo clocks, the “feeling” is quite different because they are using an animated cuckoo made of plastic and a recorded cuckoo sound. The cuckoo clocks are made of Limetree (or Linden Tree, Latin name: Tilia). Those trees with their heart-shaped leaves are quite common in Europe. Their wood can be used very well for carvings. If you have ordered a cuckoo clock on our website and need parts for it, we will of course care for this. However if you are searching for parts for an older cuckoo clock we would like to ask you to contact a shop which is specialized in selling clock repair material. http://www.timesavers.com/ have almost everything you may need from hands and weights to complete carvings and whole new movements. What service do cuckoo clocks need? Usually cuckoo clocks run for many years without problems as long as they hang in a friendly environment (not humid, not dusty, the temperature should not fall below 32ºF = 0ºC). We recommend that the movement should be cleaned and oiled by a clockmaker each 6-8 years. To send the clock, pull the chains so the hooks are under the case. Insert a piece of string, wire or a twist wrap through all the chains “as close as possible to the case bottom.” Bundle up the chains in a small bag, or a piece of aluminum foil and tie up the bag tightly with a rubber band or string. This prevents the chains from coming off the wheels, and creating a snarled mess of chains inside the clock. Put a strip of paper in the spiral gong on the inside of the back access panel. Pack the clock in an oversize box with crushed newspaper, (do not use Styrofoam peanuts), and then wrap the pendulum, and place in box. If you are shipping the clock to a service station do not send the weights. If there are any numbers on the weights, ( 275 or 320,etc. ), write them on a piece of paper, along with your name, address, phone number, your Email address, a short description of any problems, and enclose in box. 1. Have the clamps been removed from the bellows inside the clock as described in the instructions (see picture)? 2. Has the cuckoo’s door been “unlocked”? You have to turn a little wire to the side, that secured the door while shipping (see picture). 3. Please check the position of the night shut-off. The most common reason why cuckoo and music do not work is that they have been turned off. With some clocks the night shut-off is a switch at the left side of the clock, with other types it is a wire under the clock (see picture). The pendulum is responsible for making the clock keep time. If your clock runs to fast, you can move the pendulum-disc down a little on the pendulum to correct this. If the clock is running to slow you have to move the pendulum-disc up.Keep in mind that moving the pendulum leaf or disc 1/8 Inch (3 mm) on the pendulum stick is equal to a 3 minute change in a 24 hour period. Please make sure that the clock is adjusted properly on the wall. The clock must be placed in a correct vertical position so that the pendulum can swing freely. You must “listen” to the clock and be sure that the clock has an even Tick-Tock sound. Do not adjust the clock with your eyes, do it with your ears. This is adjusted by moving the clock to the right or left, until you hear the tick tock sound which is even. Before hanging up the clock, carefully read these operating instructions. THIS IS VERY IMPORTANT !!! Unpack with care! When removing the clock from the carton, please hold it at the roof. Remove the loose accessories such as pendulum, weights etc… Please do not open the small paper-bag fixed to the bottom of the clock, this will be done later. Lay the clock down with the face downwards and turn aside the locking tab (A) on the back wall. Place a nail or a screw driver into the slot (B) and gently lift out the back panel. Remove the paper strip from the chime spring (5). Remove – depending on the model – one or two clamps(Pull Out)from the bellows (6). Please be careful that no wires of the clock will be bent or damaged. Now hang up the clock (10) on a strong nail or screw which is fixed to the wall in a HEIGHT of about 2 meters(6-7 Feet) from the floor (11). Open the packet (8) underneath the clock containing the chains and pull out the wire. Possible knots in the chains should be undone very cautiously. Please notice that henceforth the clock must not be put down or turned upside down – otherwise the chains will slip off from the chain- wheels. The chain can be replaced again by fully winding up the other weights and hooking them off; hereafter the clock must be turned upside down and the chain has to be balanced upon the chain- wheel; it is advisable to remove the back panel in order to observe the replacing of the chain on the chain-wheel through the chain holes in the clock case. Turn the wire which locks the cuckoo door (Fig. 7);to the side. In the case of Music-Cuckoo-Clocks, two wires (= two doors) must be turned to clear the doors. Hang the pendulum in the wire loop in the middle of the case bottom (Fig. 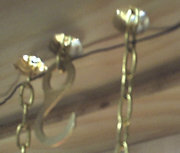 9) hang the weights on the chain-hooks. The clock must be placed in a correct vertical position so that the pendulum can swing freely. Now your clock is ready for operation. For setting the correct time turn the minute-hand (longer hand) around to the left. NEVER move the hour-hand (small hand). If you turn the minute-hand around to the right, always wait for the end of the cuckoo-striking on the half and full hour; In the case of a music-clock, always wait for the end of the music. For starting the clock gently push the pendulum to one side. The clock hangs in the correct position when the “tick-tock” of the pendulum is even. Listen for the even “tick-tock” sound, and adjust clock to the right or left as necessary. Depending on the model the clock must be wound up each 24 hours or each 8 days by pulling the ring on the end of the chain downwards thereby raising the weight up to the clock. The accurate time of the clock can be regulated by the pendulum. If the clock gains time push the pendulum-disk downwards on the pendulum-bar; if the clock looses time push the disc upwards. Several models are available with the possibility of turning off the striking mechanism – this is indicated by a stick-on label. (12 or 13).